In some ways, Hog-eyed Man is not just a duo. We have the great fortune to play, perform, and record with a community of southern-based musicians. Here are some of our pals and heroes. Beverly Smith is one of the most respected guitar players and singers in old time music today. She's also a dynamite fiddler and pretty dang good on the banjo. Beverly has performed and recorded with mandolinist Carl Jones; fiddlers Bruce Molsky, Rafe Stefanini, Tara Nevins and Brad Leftwich; and singers Alice Gerrard, Mick Moloney, John Doyle, and Laurie Lewis. On recent duet records with John Grimm, all of her musical skills are on full display. If that weren't enough, she is a really wonderful person with a generous spirit. We love playing and hanging out with Beverly and were delighted to have her appear as a guest guitarist/singer/fiddler on Hog-eyed Man 3! John Grimm is an award winning multi-instrumentalist who has played with The Georgia Mudcats, The Georgia Potlickers, Rural Radio Company, and other oldtime bands. He received the Dr. Gene Wiggins Award in recognition of his long and significant contributions to traditional music in north Georgia. Dr. Wiggins was the author of the book "Fiddling Georgia Crazy" -- the definitive book on Fiddlin' John Carson. John even played the role of John Carson in the PBS film "The People vs. Leo Frank"! When he's not touring, John runs a superb instrument store in Dahlonega, GA, and teaches fiddle with the highly successful "Pick & Bow" after-school program. He's also a super nice guy with whom we are always happy to hang out. 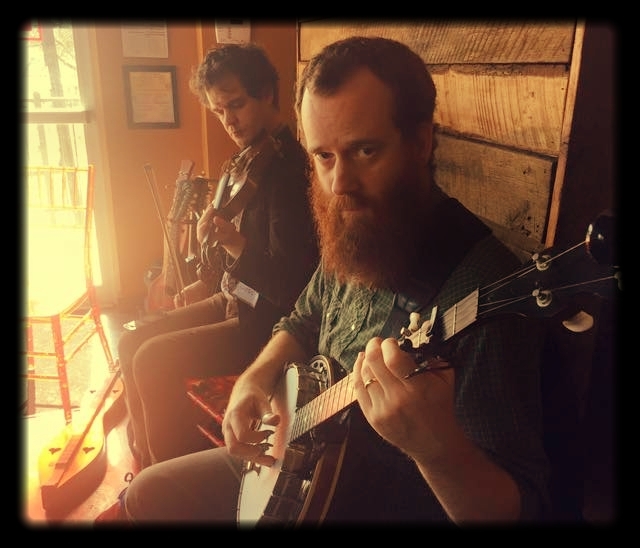 Jason and John have twice won second place performing as a duo in the band contest at the Georgia String Band festival! John also played fiddle and banjo with us on Hog-eyed Man 3. Tom Baker, a native of Georgia, played piano and trumpet in his early years and later took up guitar and bass. While in high school, he inherited a five-string banjo from his uncle, Niles Puckett. Upon discovering the music of Bela Fleck, Tom became interested in bluegrass, folk, and old-time music and began learning Scruggs style banjo, and eventually, clawhammer. After moving to Athens in 1998, Tom formed the highly-acclaimed Packway Handle Band with high school friends, which is still going strong today. We have played a lot of oldtime music with Tom over the last couple years, and we had a blast recording with him on Jim White's amazing outsider-folk album Waffles, Triangles & Jesus. We were thrilled that Tom joined us to record our fourth oldtime record, which was released Nov. 2018 on the Old-Time Tiki Parlour label! Rob first met Charlie and Nancy Hartness wandering down a random street in Athens, GA. Jason and Charlie quickly discovered a shared love of quirky southern fiddle tunes played in living rooms, kitchens, and basements. The rest is history. Charlie is our favorite fiddler/ukelele player/songsmith/squirrel observer/poet/retired-emergency room doctor in Georgia. Nancy makes weird sock puppets, sings great, and plays rock-solid guitar in that way that makes everybody in the jam play and sound better. These folks turn life into art. Charlie and Nancy are in demand these days as top-shelf oldtime music accompanists -- if you don't already know, check out the Sky Island Stringband (with Jimmy Triplett) and Spencer & Rains' recent recordings. They also have released an exceptional CD of original and traditional material. We are happy to get to play and hang with Charlie and Nancy on a regular basis. They played a ton on our most recent oldtime record, released Nov. 2018! For Jason, it was the honor of a lifetime when Art drew his portrait for the posters, coffee cans, and T-shirts promoting the 32nd North Georgia Folk Festival in 2016. On his 79th birthday, Art stopped by to join us for two numbers that are on Hog-eyed Man vol. 4, and they are really, really good. Thanks Art, for all you do!